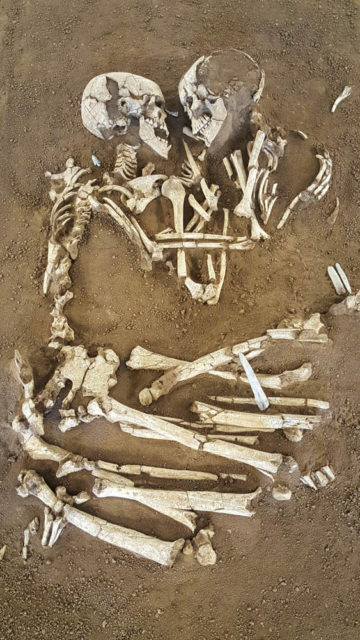 The Valdaro Lovers is the name given to two skeletons who have been locked in an eternal embrace for the past 6,000 years. 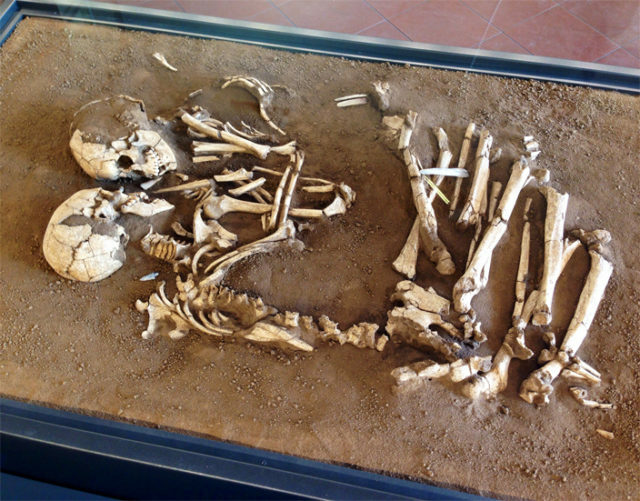 The embracing skeletons were discovered in 2007, at a Neolithic tomb near the village of Valdaro in Mantua, Italy. 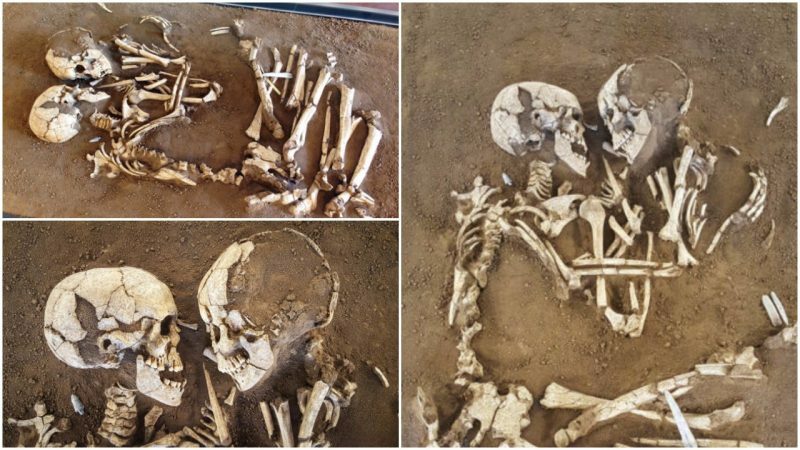 Scientists think that the couple were no older than 20 years when they died and were approximately 5’2″ (157 cm) in height. After an osteological examination, there was no evidence of violent death; many historians believe they died that way due to the flints tools that were found with them. The male skeleton was found with a flint arrowhead near his neck, and the female had a long stone blade along her thigh, plus two flint knives under her pelvis. The most reasonable explanation after the examination is that the flint tools were buried as grave goods along with them. It is fascinating that the bodies were positioned that way after their death. They were found in a necropolis, so they did not die that way by accident, rather, it is thought that they were positioned that way. 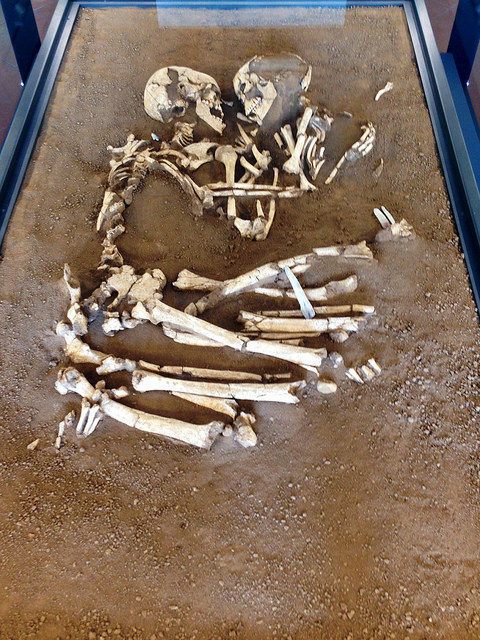 What’s more impressive is that, during the Neolithic period, double burials were very uncommon which makes their position unique. 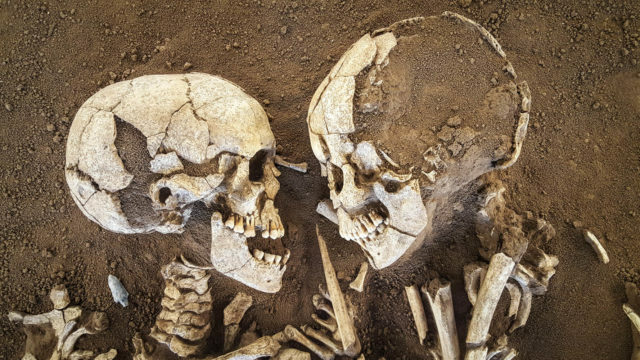 The Valdaro Lovers are the only case of a double burial in Northern Italy. When they were found, the media published photos of them, causing great excitement worldwide. The archaeologist who led the excavation was Elena Maria Menotti. Because the skeletons were found just ten years ago, it is very challenging to define anything about them so quickly. It is a long process where each bone will have to be studied thoroughly. Menotti decided, therefore, that the couple should not be separated and that they should be moved and preserved as they were found. So, the excavation team dug up the block of earth in which they were discovered and placed them in a wooden box. From the site, the Lovers of Valdaro were sent to the Musei Civici in Como. In September 2011, the skeletons were displayed in public at the Mantua’s Archaeological Museum. According to professor Silvia Bangoli, the president of the association “Lovers in Mantua”, around €250,000 should be enough for the Lovers to have an exhibition center of their own, and €200,000 more could be used for a multimedia space in which the world can hear the story of the embracing lovers. The association “Lovers of Mantua”, is still seeking a home for this ancient couple where they can be displayed permanently.